A phone card was issued for Nancy Drolet in October 1997. There were 1500 copies printed. The value is listed as $ 2,50 and the price as $ 6,50. 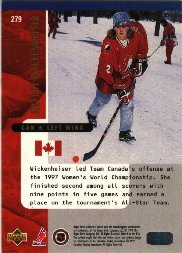 Upper Deck released a set of 20 women's hockey cards after the 1997 Women's World Hockey Championship. The 20 players in this set all played on the Canadian Women's National team. Unfortunately Team USA was not included in the set. These cards are part of the National Heroes subset found in the 1997-98 Upper Deck NHL Collector's Choice Series. Here are links to a slightly different scanned version of these hockey cards. Cards W1-W20 are Team Canada players, and cards W22-W40 are Team USA players. Here is the price list for the women's hockey cards. Here is a link to Alan Chim's women's 1994 Classic Card Set. 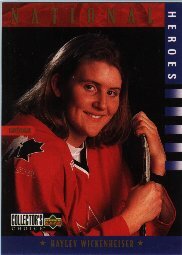 This link includes photos of the cards for Ulion, Whyte, Granato, Rheaume, Wickenheiser, and Campbell. Since these cards are a "one per pack" insert for a relatively low volume set, and since these are the only cards ever made for 36 of the players, the demand far exceeds the supply. Specifically, according to Classic, there was a production of 6,000 U.S. and 2,000 CDN cases, each of which had 10 boxes per case, and if we assume there were 36 packs per box, and with one Women in Hockey card inserted per pack, that means there are only 54,000 possible sets in existance in the U.S., and only 18,000 possible sets in existance in Canada. Given the difficulty in compiling a set, I would suggest that there are only 10,000 or so complete sets in existance. In contrast, Upper Deck prints in the neighbourhood of one to two million of each of their hockey cards, so the Classic cards will be much more rare and scarce, and should continue to command a premium long after the mass produced cards from Upper Deck are available. 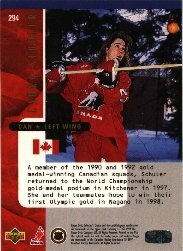 Don't get me wrong, I am thrilled that Upper Deck will be featuring female hockey players for the first time [in their 1997-98 set], but lower production runs are one of the largest determiners of value in hockey cards. 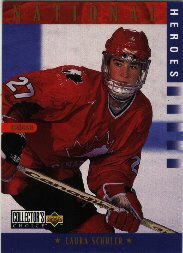 For example, Eric Lindros' Score Rookie Card is worth $15, but his 7th Inning Sketch Memorial Cup card is worth $40! 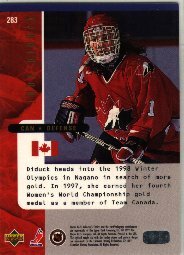 In addition to female hockey, I have been very involved in sportscards for 8 years, and based on my experience, after the 1998 Olypics, you will not be able to buy a set of these cards for less than $50. 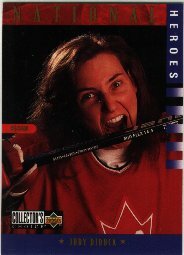 Currently, only Manon Rheaume, is very expensive, but watch the other cards to take off too! 1992/93 Classic Prsidential              #1     $10.00 U.S.
1992/93 Classic Promo                    #NNO   $10.00 U.S.
1993/94 Classic Draft                    #MR1   $25.00 U.S.
1993/94 Classic Draft                    #AU11 $125.00 U.S.
1993/94 Classic Draft Crash              #N8    $35.00 U.S.
1993/94 Classic Pro Prospects Prototypes #PR2    $6.00 U.S.
1993/94 Classic Pro Prospects            #AU2   $75.00 U.S.
1993/94 Classic Pro Prospects BC's       #BC10  $10.00 U.S.
1993/94 Classic Pro Prospects LP's       #LP1   $20.00 U.S.
1994/95 Classic Draft Previews           #HK4   $15.00 U.S.
1994/95 Classic Draft                    #AU3  $100.00 U.S.
1994/95 Classic Draft Autographs         #NNO  $100.00 U.S.
1994/95 Classic Picks                    #CP15  $15.00 U.S.
1994/95 Classic Pro Prospects            #AU7  $125.00 U.S.
1995/96 Classic Autographs               #NNO   $60.00 U.S.